colonial houses | Real people don't hire architects...? I am often attracted to architectural projects that cross artlessly over the line between stylistic and strange, which they mostly do by crossing imaginary lines between style and style. Strange is a holistic sort of term, like hot or big. No one ever thinks to ask why a thing is big. They just know that it is. It is like that with strange, which the house in the photo most certainly is. Once defined in such terms, a thing tends to acquire value based on the degree of bigness, hotness, strangeness, etc. that it demonstrates. This house, for example, probably falls somewhere in the middle on the strangeness meter. I expect that it could be a hard sell to an intellectual or sophisticated buyer, not so much to someone looking for features and even less so to an eccentric with a special agenda. My interest is to discover whether analyzing the design has the ability to change our perception of it. Without question the flat blue facade with the angled square window conjures up “postmodern” contraptions the likes of which Michael Graves may forever lament. It collides with the not so subtle reference to rustic Western towns set in rugged terrain, consisting of unpainted wooden buildings in rows made rigid by flat facades, and counterfeit by perfectly aligning parapets. 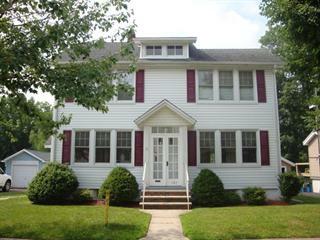 Not to be overlooked is the fact that what we really have is a two story colonial box with dated modern style windows. Ok! I take it back. Analysis only makes it more strange! Not so long ago, home builders of every elk understood that employing a few fool proof tricks of the design trade could actually create enduring architecture, serving both resident and neighbor for many, many years to come. Symmetrical elevations and plans work, even if the individual elements are anything but classical. Vestibules work, especially when a graceful visual presence is provided by a single story gable, glass panel walls, and matching double doors. Arts & Crafts shed type dormers work when reinforcing a symmetrical elevation. Multiple windows in a row work when mirrored side to side and up and down. These elements can be read like a book. They say this house has a living room on one side and a formal dining room with kitchen behind on the other. Upstairs there are likely 3 bedrooms, two of them being the same in width. The main rooms in the house are light, all having at least one wall of windows. The house is modest, its perception grand. I am left wondering how we have come to prefer suburban mansions, or rows and rows of urban density? Has moderation been forever lost?